Dr. KoKo Covington was born and raised in Manhattan, Kansas, and has lived in Greenville since June 2012. All it took was one trip to Greenville for KoKo to fall in love with this area and want to move to the Upstate…and she did! KoKo attended college at the University of Nebraska, where she played on the softball team, was a member of Kappa Alpha Theta sorority, and majored in Business Administration. She then obtained her Doctorate of Dental Surgery from the University of Nebraska Medical Center College of Dentistry. 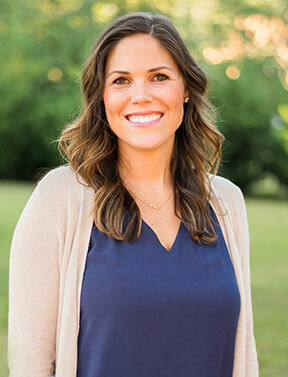 While in dental school, she served as President of the Nebraska Student Dental Association and participated in many of the outreach programs providing free dentistry across the state of Nebraska. KoKo completed a general dentistry residency in Birmingham, Alabama. The residency allowed her to hone her skills in all areas of dentistry, and learn how to properly treat medically complex patients, especially patients with head and neck cancer. KoKo met her husband, Kip, at her residency interview. Kip was finishing the program as KoKo was starting, but the overlap was long enough for them to begin dating… the rest, as they say, is history. Kip and KoKo were married in St. Thomas in August 2012. They welcomed their first child, a son, in April 2015 and a daughter in July 2017. KoKo opened the Five Forks office in January 2013, and has enjoyed the opportunity to get to know her patients and she loves her staff. There isn’t a day that goes by where laughter isn’t heard throughout the Five Forks office! Besides dentistry, she enjoys traveling, cooking, reading, watching football and volleyball, playing any sport, learning about World War II, and spending time with her family and friends.